Vickie Y sharing a card using my favorite color combination today, white, pink, and green! 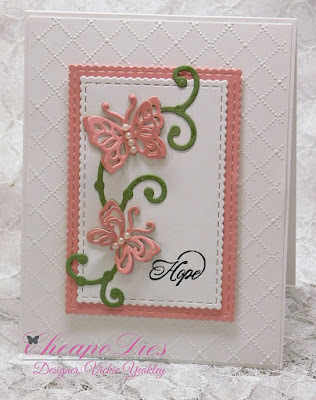 I used the Exclusive Cheapo Dies Butterfly Flourish die. 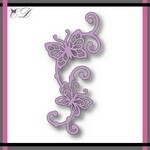 I die cut the Butterfly Flourish once using green cardstock and twice using pink cardstock. I fussy cut the pink butterflies from the flourish and layered them onto the green flourish. Used small adhesive pearls to embellish each butterfly. What a wonderful die and I love the equally beautiful card you made with it.